in cool pond waters reflecting. ***I took these photos on the island of Oahu—at the Valley of the Temples in Kaneohe. If you are planning a trip to Hawaii, this is a beautiful place to visit. This entry was posted in birds, Nature, Photo Essay, photography, Poetry, Travel, wildlife and tagged carp fish, clouds, Oahu, Pond, Swan, Water. Bookmark the permalink. Your welcome! It’s my pleasure. Reminds me of cancan dancer. Nice pictures. Thanks for visiting my blog and liking my Swan pics. Thanks. I enjoyed your photos. There is something inherently beautiful about a swan…. Thanks so much for the compliment, Jackie! Absolutely beautiful! What a moment to capture. Thanks for sharing. Thanks Pat! Black and white and shades of grey–it is a beautiful swan. So glad it stopped for a photo! Gorgeous portrait (second one). Like it a lotl We have a lot of white swans in our neighborhood but the black one is a special. White swans in your neighborhood? Around here we have ducks, geese, and many smaller birds. No swans. I was on the island of Oahu when I saw this black swan. I have never seen anything like this around here. Neighborhood where I live has the name Swansea and it is true. We have a lot of this gorgeous birds around. Even at winter time they stay here. They suffer from freeze and lack of food but do not leave this place. I have few pictures of them in my blog (Grenader Pond). It must be nice to live near to such a beautiful pond. You must go there often! With their heads hidden under their wings, the cold swans in your photographs (at first glance) do look a lot like white drifts of snow sitting on a frozen lake. Your poetry is magical. And the swan looks all dressed up in ruffles for a special occasion. An amazing post and sooo beautiful! 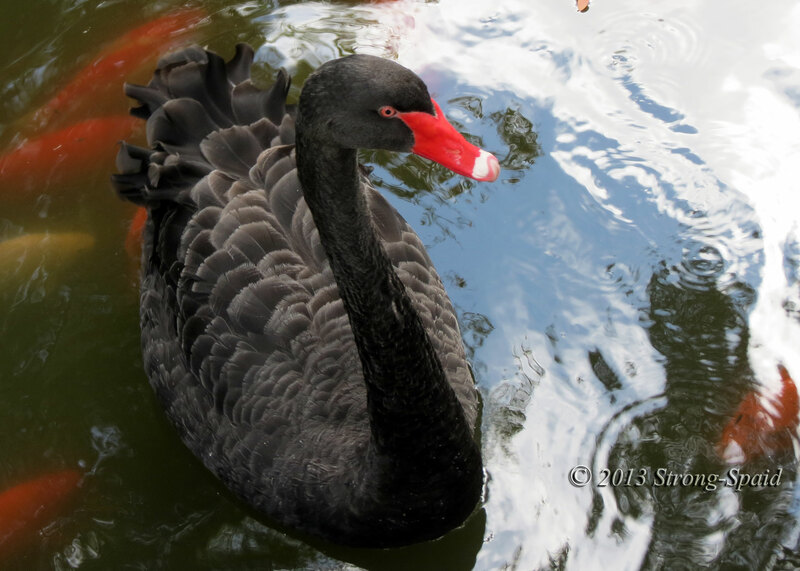 I thought the black swan looked quite elegant too…. I did not know the Black Swan was considered an ominous portent, so I looked it up on the internet to see if I could find out why. Considering the above definition, I am a black swan. (In fact, all of the creative people, artists, writers, etc…..probably fall into the “black swan” category). The swans feathers are amazing, so wavy and sleek. I love your photos and words. You are truly lucky to have been to such beautiful place! Yes I was lucky to be there! Thank you…the black swan is such a beautiful sight! I love swans! Beautiful pictures. I don’t see swans very often, and it was the first time I had ever seen a black swan in the “real” world. Graceful they are! What an elegant swan. Great photographs. Really awesome creature of nature….keep posting like this.. 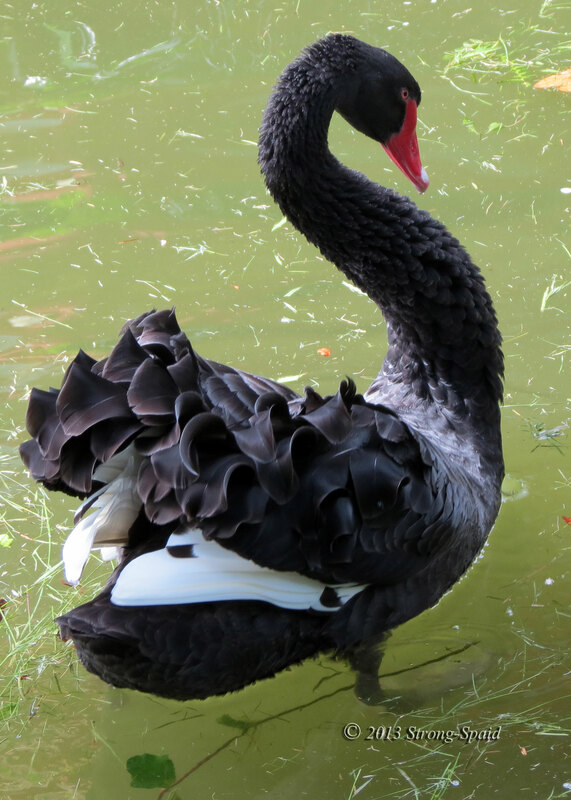 I agree…..black swans are quite extraordinary. It’s true. Black swans are eloquent in their black and white feathers. The swan would blush if it could hear all the compliments! I love the photos that you post…..of places, people, and food that I have never seen before. Living vicariously through the images, I am. What a lovely comment! Thank you.. . . I love the first photo. It looks like a painting! Thank you. I guess you could say that nature was painting! Beautiful. I love your images and writing. And thank you for following my blog. I love yours. It was almost as if the swan was posing. I’ve never seen those ruffled feathers before. Beautiful! I didn’t know that swans had ruffled feathers in the back either. Beautiful photos of the swans. I used to have a pair nest on my property years ago and prior to that there was a pair which built their nest near a town about twenty miles away from where I grew up. Dad always said you could predict how wet the winter was going to be by the height of their nest. Thank you! That’s very interesting. There are no swans near my house, so I have never seen a swan nest (high or low, I wouldn’t know). We had a pair of black swans nest on our property the first year…the nest I referred to was about twenty miles away in a swampy area. Hence the comment about the height of the nest. Mary, this is truly magnificent, bot your specimen and the shots! I certainly didn’t type that very well, did I? “regal beauty and form” … this is a perfect statement for the black swan. great photos ! Agreed….very regal. All dressed up, with ruffles included. Very beautiful bird! Thanks! They were the first black swans that I had ever “met” in person.